The wearable electrical awareness revolution – a wave of innovation to save lives. Like brooding vipers, dangerous voltages and currents lurk throughout the modern workplace. Every year, hundreds are struck by them and experience the searing heat and intense pain of electrical current as it flows through their bodies. Fatalities, horrific burns, and damaged lives are the result. Sadly, many of these injuries could have been avoided had the employee been using a Personal Voltage Detector. Although many survive their initial contact, injuries from electrical contacts often take months to develop. Often, electrical burns require many surgeries, especially when the cooked internal tissues continue to slowly die for months after the actual contact. Some electrical burn victims describe the pain experienced during the healing process as being so bad they had wish for death instead. Without the ability to see or hear electricity, a momentary lapse or a simple unexpected condition is all that’s necessary for someone be hit by electrical contact. Electrical contacts on the work site have been unacceptably high for decades. In fact, electrocution is one of the OSHA’s Big Four. When workplace fatalities are tallied up, we quickly see the evidence that falls, struck-by, caught in between, and electrocution are the perennial contenders for the top spot. Most everyone who works around electricity knows someone who has been personally impacted by an electrical contact. Comprehensive safety regulations and extensive training programs have helped reduce the numbers of workers struck by electrocutions, but despite this they are still unacceptably high. Safeguard Equipment’s founders and the vision that led to the design and development of the Compass Voltage Detector was founded on this contention. When they met as college students at the University of Idaho they quickly realized that the three of them had grown up in households where family members worked in the electrical utility industry. They shared stories of the horrific electrical accidents that each were aware of. Their extensive research into technologies and designs revealed that a new product was needed to give electrical workers an incredible new ability to perceive electrical hazards before it was too late. Human beings were already equipped with a couple of hazard sensing capabilities – we use our eyes to see and our ears to hear danger. The Safeguard Compass was designed to augment these senses and give the wearer an ability to see and hear electricity. With some creative design work and input from experienced linemen, the Compass was engineered to attach to the underside of a hard hat and thus easily provide an interface with these innate human sensory capabilities. Seeing and hearing electricity was a tantalizing idea. Historically speaking, it was one of the greatest limiting factors in electrical safety. Undaunted, the engineering and design process began and after rigorous testing, Safeguard’s Compass was born. Compass fits comfortably to the underside brim of any standard hard hat. The Compass design utilizes a lithium-ion battery to power its advanced sensors that have only recently become available. As the sensors operate, an integrated circuit executes software that makes the sensors listen and watch for two tell-tale signs of an impending electrical hazard. Once it senses an electrical field, it issues an immediate alert and then quickly analyzes the environment to determine the direction of the present source of the danger. It makes these assessments in fractions of a second. As the wearer gets closer to the source of voltage, the additional on-board LEDs light up and the audible alarm begins to sound with increasing frequency. The Compass’ electrical “ears” help it point the way to the source of voltage by sweeping the LED’s in that direction. This is just one of Safeguard’s many departures from previous versions of a Personal Voltage Detector . The directional ability and intelligence of the unit greatly surpasses older/bulkier “dumb” devices that simply squawk at the presence of an electrical field. In all honesty, it may not be appropriate to consider Safeguard’s Compass to be just a Personal Voltage Detector. It is much more advanced with its additional built-in sensing technologies. It is always listening and watching for electrical currents and is ready to issue alerts and then point to the direction of the danger. The combination of these two sensing capabilities literally puts the Compass on an entirely new level. Compass alerts the employee when a conductor in their environment holds and electric current. Centuries ago, a few people theorized that current flowing through an electrical conductor created a circular magnetic field around that same conductor. In 1820, a physicist by the name of Hans Christian Oersted, was participating in an electrical seminar. As a switch was closed as part of the demonstration, he noticed the needle of a directional compass (placed next to the wire) deflected as the current was turned on. The magnetic field created by a current flow was observed, evidenced by the directional compass. By use of this same magnetic field and current flow relationship, Safeguard Compass created its new type of electric safety vision. With highly advanced magnetic field sensors, the unit not only listens to the electric field environment, it also listens and watches for magnetic fields that are produced by current. This is an important breakthrough that forges a new direction within the realm of wearable electrical detection. Magnetic fields can not be shielded in the same way electrical fields can. Soil, concrete, some types of conduit, and even human tissues all block electrical fields. On the other hand, magnetic fields pass right through these barriers. This means that current flowing in electrical conductors underneath the soil and within conduits or duct banks can now easily be detected. In fact, current-generated magnetic fields can be detected from the outside of service panels and the secondary side of pad mounted transformers. When the Compass unit detects voltages, it lights up red and strobes to indicate direction. When it detects the magnetic fields caused by currents, it strobes blue with an increasing intensity as it gets closer to the magnetic field. The magnetic field sensing capability gives the Safeguard Compass a way to detect buried conductors that carry current. 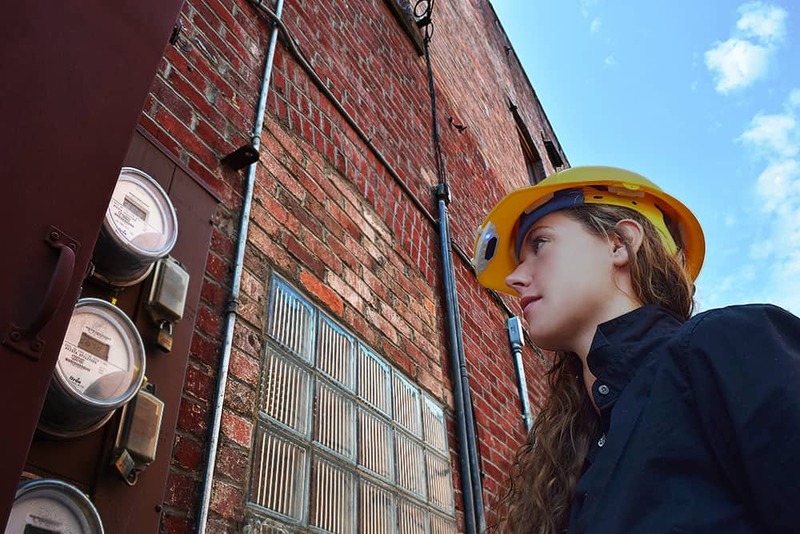 Since magnetic fields are difficult to shield, the designed location of the Compass on the brim of a hard hat helps it to overcome a dangerous limitation of other Personal Voltage Detectors. Those other devices worn on a lanyard or the front of a body can create an illusion of safety. But when the workers’ body shields the electric field from the unit, they are not fully protected. A worker can easily limit the detection capabilities of these Personal Voltage Detector by simply turning around. On the other hand, Safeguard’s Compass maintains consistent electrical field awareness in a 360-degree radius around the user. Experienced electrical workers, telecom professionals, construction workers, EMS first-responders, agricultural workers, and those within industrial settings are just a few of the occupations impacted by electrical contacts. Safeguard’s Compass provides a number of different settings, allowing users to calibrate their device to provide the appropriate level of detection for the intensity of the electrical hazards or situations they are exposed to. Plugging the device into the charger and charging cable, a simple one-button operation allows the wearer to change settings for both voltage and current sensitivities. The immediate and widespread adoption of Safeguard’s Compass bears testament to its intelligent and innovative design. Workers across the globe are purchasing the Compass to obtain a “sixth sense” of electrical safety. With continued adherence to safety regulations, participation in effective training programs, and use of the Compass, we can now help stem the annual tide of electrical contact accidents. Employees working around high voltage need Compass. Join the wearable safety revolution today and help shift the needle to a new direction in electrical safety!